On Halloween, or whatever day your neighborhood goes trick or treating, there is a big decision that needs to be made, and it doesn’t involve costumes. Will everyone go trick or treating or will someone stay behind to hand out candy? So much to consider. 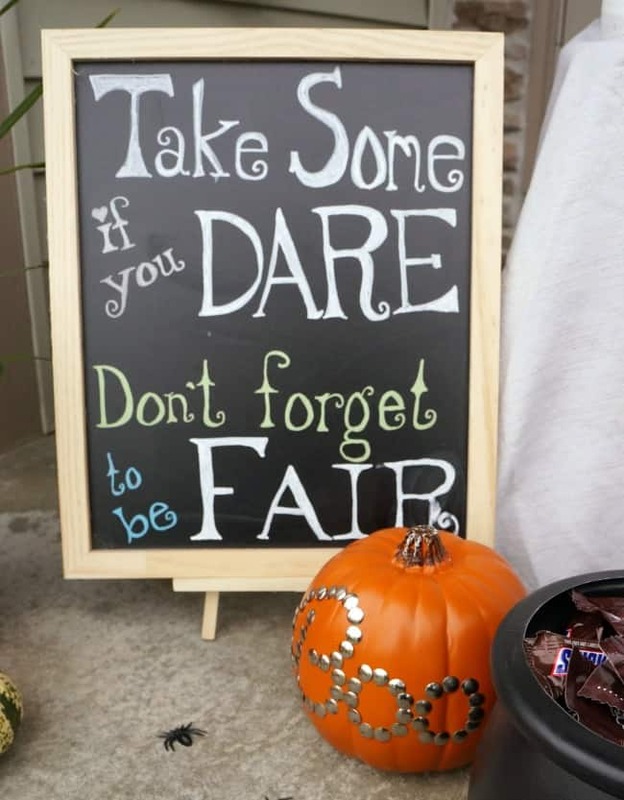 Do you trust the neighborhood kids to be fair and not take all your candy? 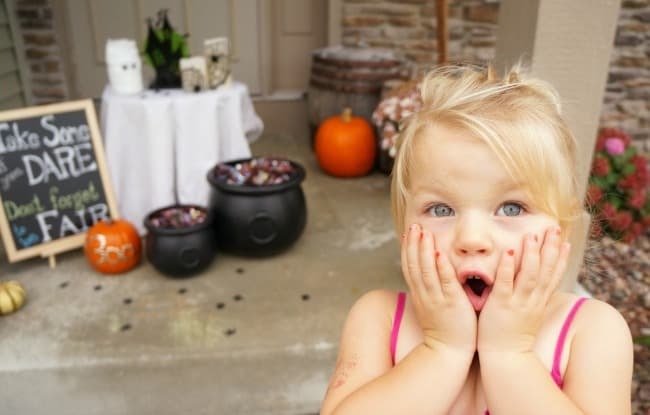 Does your whole crew want to trick or treat or would the big kids rather head out on their own without Mom and Dad? Our kids are little, and our neighborhood likes to do a little adult trick or treating, so this year we have opted to leave the candy on the porch and head out as a family. But I’m leaving it out in style, check out our trick or treat Halloween porch. 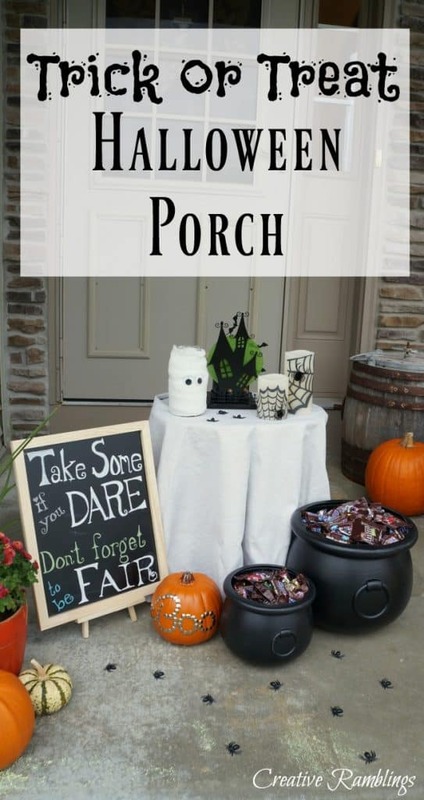 The key to this Halloween porch is lots of candy. I don’t want to be stingy and I know kids are going to help themselves so I needed to stock up. I want my Halloween porch to be inviting but a little spooky, most of the children in our neighborhood are young and I don’t want to scare anyone away. 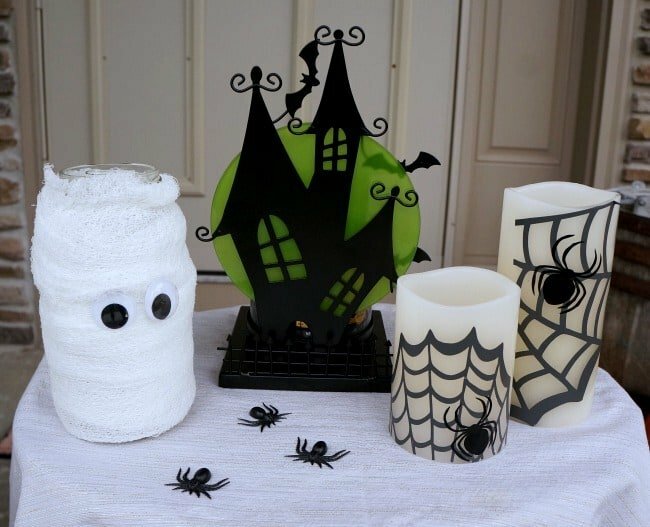 I set out a table with a few of my favorite DIY Halloween items; Spider candles, Mummy jar, candle accessories, and faux pumpkins. 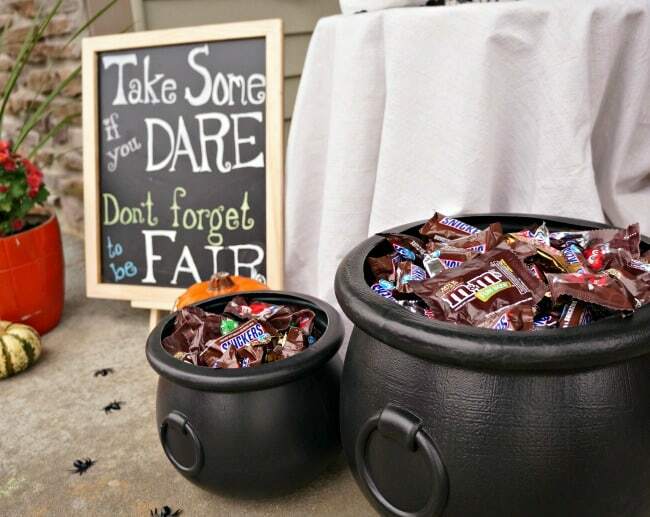 I filled 2 plastic cauldrons with candy and added a sign that reads “Take some if you dare, don’t forget to be fair”. You can see my tips for creating this sign here. All of these Halloween pieces look perfect set against my fall backdrop of pumpkins and mums. I’m ready to head out with my family and leave this fun and spooky display on my porch this Halloween. Tell me, how do you handle trick or treat in your neighborhood? Leave a bowl or leave a family member behind?